(Abuja, March 25, 2018:) The Liberian Community in the Federal Republic of Nigeria has bestowed honors on Ambassador Al-Hassan Conteh and Justice Micah Wilkins Wright for their respective services rendered to the Community and Liberian nation. 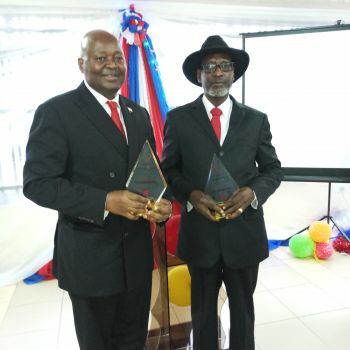 Under the auspices of the Organization of Liberian Communities in Nigeria (OLICON), the Diaspora Community said it was honoring the two ‘distinguished Liberian personalities’ for being ‘sources of pride’ for Liberia in Nigeria in particular, and the ECOWAS sub region in general, a release from the Liberian Embassy in Abuja says. The program for the presentation of awards in honor of Ambassador Conteh and Justice Wright was held at the Embassy of Liberia’s premises in Abuja on Saturday, March 24, 2018. Professor Conteh is Liberia’s Ambassador to Nigeria, with concurrent accreditations to the Republics of Benin and Equatorial Guinea. He is also Liberia’s Permanent Representative to ECOWAS. Justice Wright is the immediate past Vice President of the ECOWAS Community Court of Justice. He is also Liberia’s former Solicitor-General who prior to that, also served as an Associate Justice on the Supreme Court of Liberia’s bench. Summarized achievements of the two honorees were presented in brief separate PowerPoint presentations by Nat Bayjay, the Minister Counselor for Press and Public Affairs at the Liberian Embassy, the release continues. “My heartfelt gratitude are due to the Liberian Community for this singular honour. This is the fourth unforgettable honor that I'll forever cherish. The third was the doctorate degree bestowed on me by the University of Liberia in 2015 for my sacrificial role in redeveloping the university as President of the UL. The second was the national honor I received from our Government for serving as the National Orator of our Independence Day in 2005. And the first was studying as a Fulbright Scholar at the University of Pennsylvania in the early 1980’s”, Ambassador Conteh narrated. “I will convey to His Excellency, President George Manneh Weah through the Ministry of Foreign Affairs this great honor that you have given me today”, Ambassador Conteh asserted. To all the diplomatic officers and staffs of the Embassy, Ambassador Conteh added, “By honoring me today, the Liberian Community, by extension, has also honored you. So we are sharing this honor”. Ambassador Conteh used the occasion to publicize the Liberian Government's ‘Pro-Poor Development Policy’ which he said is in part motivated by President Weah’s own story growing up in humble circumstances, and the crunching economic realities and hardships in Liberia today. “I invite Liberians everywhere to support our government's Pro-Poor Development Agenda. Areas of urgent need include trade and investments in infrastructure, especially electricity, water, health, education, agriculture, and tourism, among others”, he added. He continued, “I invite all of you to help mobilize investors. And for those of you who are qualified, to respond to the clarion call of our President, when he recently visited Nigeria, to return home to contribute your quota. For his part, Justice Wright, in response, described his honor as a “memorable and an emotionally charged” occasion for him and his family. “My friends, my model in life is that life is meaningless if all one does is for himself and his immediate family alone. I share the view that if I can help somebody along life’s way, then my living will not be in vain. I believe that one should always strive to make somebody else’s life better and leave anywhere you go and everything you touch better than what it was when you met it. What good is it to be known to have lived and died and that is all. What use is one’s existence if all he does is for himself and his family only?” he said. “You’re assured that the honor you do for me today, though personal to me, should go out as an encouragement for others that similar will be theirs if they do likewise”, he added. In two previous separate PowerPoint presentations, several Liberians resident here and who have also relocated to Liberia through short video clips told of how impactful the two honorees have been in their respective lives. Members of the diplomatic corps, officials from the ECOWAS Commission and ECOWAS Court of Justice including Justice Yusuf Kaba, the Court’s Vice President, diplomatic officers and staff of the Liberian Embassy, the national leadership of the Liberian Community and Liberians from across Nigeria and friends of Liberia graced Saturday’s honoring program.